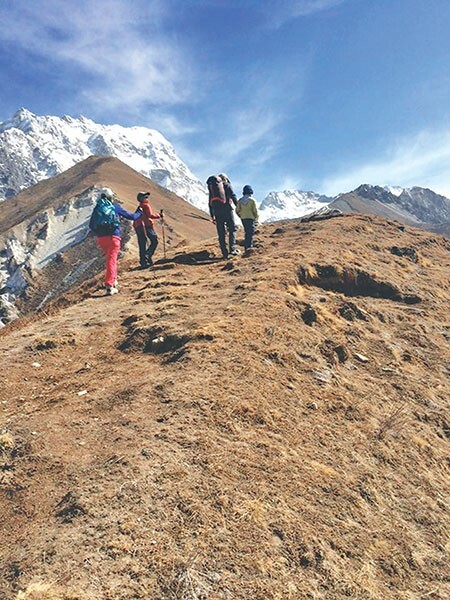 Tourist arrivals to the popular trekking destination of Langtang Valley in Rasuwa have rebounded after plunging steeply following the 2015 earthquake. Visitors began avoiding Langtang after a devastating avalanche set off by the earthquake on April 25, 2015 swept away an entire village. More than 650 people died in the disaster, and more than 100 are still listed as missing. Langtang National Park is located north of Kathmandu and adjoins the Chinese border. According to park records, tourist arrivals dropped to 4,292 in fiscal 2015-16, or to less than a third of the usual number of trekkers who visit the park annually. Before the earthquake, more than 15,000 tourists used to visit Langtang every year. Arrivals began swelling after new hotels were constructed and foot trails damaged by the quake were repaired. In the fiscal year 2016-17, more than 8,000 tourists visited Langtang, according to Ajit Parajuli, park ranger of the national park. “There has been a tourism turnaround in the valley, and visitor numbers have started to increase gradually,” said Parajuli. The valley’s trekking trails are unique selling propositions, and with three trails opened to tourists, visitor inflows are expected to rise in the future. Panoramic views of Langtang Himal and Gosaikunda Lake and the diverse flora and fauna of Langtang National Park are the major attractions of the valley. Tourists can now trek over three foot trails: Dhunche-Gosaikunda-Helambu, Syaphrubesi-Langtang and Tamang Sampada Marg in the Langtang area. According to locals, trekking is safe following the restoration of basic infrastructure on the trekking trails. A consumer forum has built a trekking trail in the region with support from the district development committee. “We have reconstructed hotels and houses in a proper manner at numerous locations on the trekking trail, keeping in mind the safety and comfort of tourists,” said Dhindup Tamang, a hotel entrepreneur and local of the valley. Many hotels have opened in Langtang, Sindhum and Kyanjin. Around 35 hotels are in operation in Kyanjin alone. Locals and hoteliers are using mule caravans to transport food and construction materials. Immediately after the quake, food had to be brought in by helicopter charter which costs as much as $1,800 per flight.